Inspired by photographs taken by Jeremy Sutton-Hibbert of the Roma gypsies of Sinesti, Romania, Suno designer Erin Beatty sent out skirts, pants and dresses with architectural silhouettes that turn out to be absolutely modern with ethnic touches. For a little bit of background, Scottish photographer Jeremy Sutton-Hibbert took those photos of the Roma of Sinesti gypsies from early 1990s through 2006, an era of change for this people who rose rapidly from poverty to wealth by dealing with scrap metal. To capture this essence, SUNO played with traditional prints, paisleys and lotus flowers, mixing them with modern blocks and stripes – traditional golden jacquards set against techno metallics. The colors in this collection, dark and true, pop with sparkle thanks to ornate Swarovski embellishment. Silhouettes are simple this sea son, vehicles for the fabric and print play throughout. 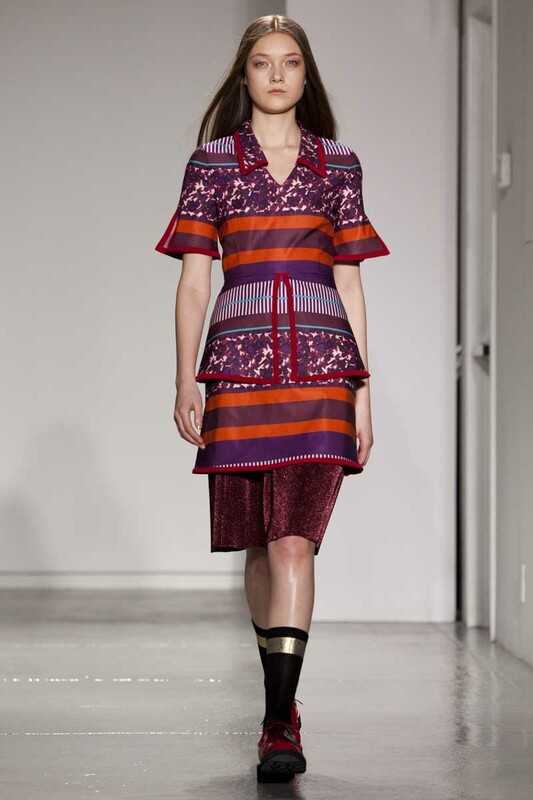 SUNO is a New York based womenswear label founded in 2008 by Max Osterweis in collaboration with designer Erin Beatty. The collection was launched in Spring 2009 after post-election violence threatened to damage the economy and industry in Kenya, a long time second home to Osterweis.